The first TBs poll is launched! (voting at top of the right column, till 2008.Jan.31). After 30 years of first LEGO Expert Builder and then TECHNIC sets, aren't you tired of seeing YELLOW construction machines all the time? Personally would prefer that LEGO starts to design some of these machines in a more realistic (IMHO) color like orange. No, don't think I don't like yellow, or the LEGO parts/sets in yellow, because I really like them too! But it could now turn to be something like: Orange, Medium Orange or Bright Light Orange (BrickLink color name conventions). It would become also a start to get more bricks of a new color instead of more and more Yellow ones. Vote (yellow vs orange), and share with us your opinion about this. "Which shade of orange would you prefer?" See this pool results, here. Just great to see you here, Philo! I understand/agree to your point, but was also thinking in those collectors who already have tons of TECHNIC parts. Maybe they would like to start getting new possibilities too!? 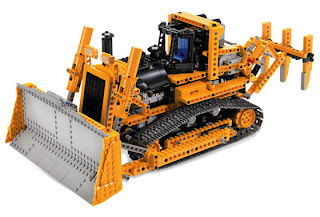 I would love to be able to build the Bulldozer (8275) in Bright Light Orange, or at least in any other Orange shade. But just a limited amount of its Yellow parts, are available in these shades :(. It would mean to end with Yellow, like LEGO made a few years ago with a few colors like grays and brown, for AFOLs sake. This wouldn't be such a drama ;-). But again, I understand and to some point agree with your perspective, specially for those whose do not have yet a big collection. But since LEGO is introducing new colors in TECHNIC like Lime, an Orange shade would be also a possibility and Yellow wouldn't not be banned at all. Where I wrote "It would mean to end with Yellow" on my previous comment, it should read "It wouldn't mean to end with Yellow". How about John Deere green? Kubota uses orange. Hitachi is sometimes green in the USA. Great to see you here also, Blakbird!!! I don't know how is that John Deere Green, apart what have seen now at YouTube. But LEGO already used green in their TECHNIC models (despite not often) and more recently introduced some larger models with Lime Green. In the USA, a very large percentage of farm equipment is John Deere, and it is all green. John Deere actually trademarked this shade of green, so I would like to see some farm equipment in this color. Very few sets are green, such as Code Pilot and the mini Tractor. The way the poll results is going, it seems most of you would like to keep the having this kind of sets in yellow, as I was expecting. However thought it worths to mention you, that IMHO, LEGO promotional photos of those and respective box photos resemble a slightly orange shade and not the real LEGO yellow. Wow, I have never seen so many comments on a TBs blog! I'm a bit tired of so many yellow machines, when there are so many more colours available. But I'd prefer LEGO didn't introduce yet another colour: it makes finding matching colours for a MOC much harder: a worsening of the "old grey/new grey" effect. Like Jennifer Clark shows us, construction equipment can have many colors (and not just yellow, or even orange ;)). So, I'm a bit against introducing more colours (even though they already exist, like the different shades of orange), and more for using existing ones. A blue crane or a white excavator would look fresh, yet still realistic. I would love to see interesting colours in Technic models, as long as they don't completely stop using yellow. I would say, if I were to choose an existing colour, that BtLtOrange (from peeron) would be a great colour to use for construction vehicles. From all orange shades, 'Bright Light Orange' would be my preferred too for some new TECHNIC sets. I also don't mean that LEGO should stop to release yellow TECHNIC sets.